Legend has it since the 11th September 1894, the day on which Barry Fishfinger was credited for constructing the world’s very first fish finger sandwich, this age-old tradition has been passed on through generations to spawn new variations and permutations which can only endeavour to pay homage to his humble legacy. Shoppers in Southampton and South Wales, where the test was conducted, confounded expectations by showing an overwhelming preference for the cod. In 1953, Gorton-Pew Fisheries, now known as Gorton’s of Gloucester, was the first company to introduce a frozen ready-to-cook fish stick, Gorton’s Fish Sticks. Cod fish fingers were first mass produced in Great Yarmouth and introduced in Britain on 26 September 1955. Whilst working in a restaurant in Islington, the fish finger sandwich was an institution in its own right. Everyone seemed to have their own opinion as to what the perfect fish finger sandwich should be……and so did I. Many a debate and discussion were had on this topic, but week after week the sales figures showed, the beloved fish finger sandwich was one of the best selling menu items, with a healthy profit margin as well. Who was I to argue with that? Except that this fish finger sandwich was made using Birds Eye frozen fish fingers. What would everyone think if they found out? Was my chefy ego getting in the way of sound business judgement? The manager was a great advocate of this ‘lower caste’ of fish finger sarnie, and tried to convince me as well, so I would give up this professional arrogance and snobbery I had instilled in me. However there were a few things that resounded from all of our versions of the fish finger sandwich – nostalgia, comfort food, reminiscing about the days growing up, familiarity and simplicity. So whatever your take on this timeless classic, the key is ‘beauty in brevity’ Benny Caspersz b.1977 – present. The following recipe is my stairway to fish finger sandwich heaven, and in case you were wondering, those frozen fish fingers….can burn in hell! 1. Pat the cod fillets dry of any excess moisture with paper towel, portion into 3 to 4 substantial fish fingers. 3. Dust each fish finger in seasoned flour, dip in egg wash (beaten eggs), and cover with Panko breadcrumbs. 4. Deep fry the fish fingers at 180ºC for 5 to 7 minutes, until golden brown. Drain on paper towel. 5. Spread the butter & on one side of both slices of bread. 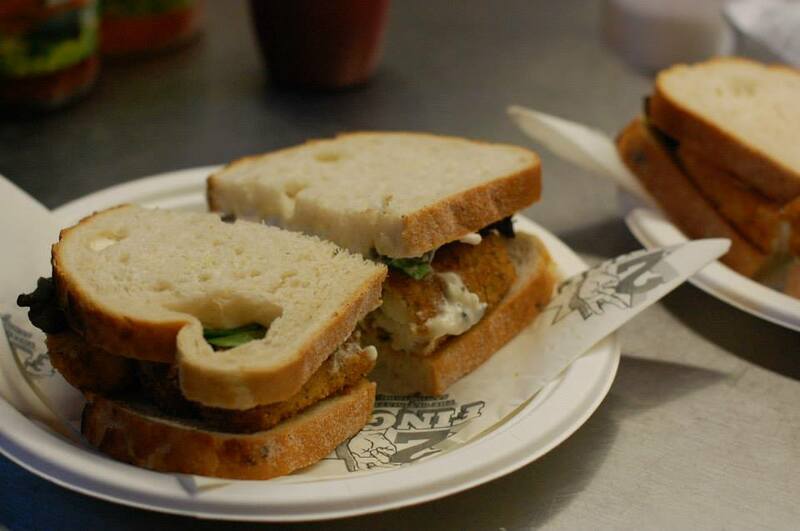 Spread tartare sauce on one of the slices, top with the fish fingers and lettuce. 6. Place the remaining slice on top, cut the sandwich on the diagonal. Serve immediately. Hi Dom…Thanks for your comments, apologies for the late reply, my blog has taken a bit of a back seat since 2 Fingers has started to take shape. I am looking into a vegetarian option…I look forward to Acoustic Sunday in September! Thank you for your comments, I will try and keep it real. Fish finger sandwich with ketchup…now thats the real deal. Tartare sauce is a recent thing. I don’t mind frozen fish fingers once in a blue moon…..it’s nostalgic.